Welcome To Fish Stalker Lures! The vision of owner Tom Mundy, Fish Stalker Lures has become known for some of the best creations to hit the water. Specializing in Bass, Crappie and Striper lures, Fish Stalker can get you hooked up! We've been putting fish on the string for years and we can do the same for you. If your passion is fishing the top bass fishing trails in America or just spending an afternoon out on the dock, we have what you need! So take a look around- we are fisherman- building lures for the right reasons - to catch fish! GLOW Ugly Green, Glow Pearl, Glow Pink, and Glow Chartreuse! IF they can't see these....well, you know! Green Pumpkin/ Texas Red, our number one color for this spring time must have! Check Out The Bite Indicator! Fish Stalker Lures is now the souths distributor of Action Tackle's Bite Indicator. Originally designed for ice fishing, it is well suited to crappie fishing in the south! Just atttach it to the tip of your rod, run your line through it and you're set. you will be amazed how easy it is to see those light bites vertical fishing. Now available in our webstore! Register with Fish Stalker Lures! Be the first to receive notices on new releases, sneek peeks at protypes, discount codes, free shipping coupons, and tips and techniques from our pros! The big/little jig is a must have for trolling!!!! 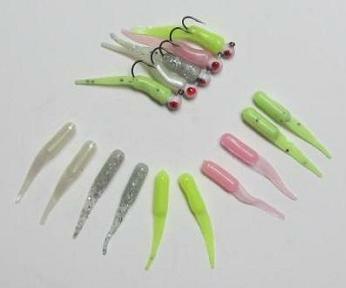 These jigs are available in all our Fish Stalker colors! You can get your extra jig bodies by clicking the shop online tab.